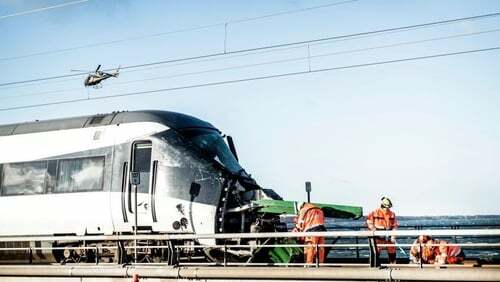 Six people have been killed and 16 others injured in a train accident on a bridge connecting two islands in Denmark, rail operator DSB has said. The accident occurred at around 6.30am Irish time on the Great Belt Bridge connecting the islands of Zealand, where Copenhagen is located, and Funen. A Department of Foreign spokesperson has said they are not aware of any Irish nationals involved in the train crash, but said they are monitoring the situation. Passenger Heidi Langberg Zumbusch had just boarded the train and taken her seat when the accident happened. "There was a loud crash and the windows started smashing onto our heads. We flew down onto the floor, and then the train stopped," she told Danish public broadcaster DR.
"We were lucky. The people in the carriage in front of us were not so lucky," she said, adding that her co-passengers told her they saw the side of that carriage had been ripped off. Car and rail traffic on the bridge were closed for several hours due to the accident, but car traffic towards Zealand later resumed while rail traffic remained shut in both directions. The Great Belt fixed link consists of a road suspension bridge and a railway tunnel between Zealand and the small island of Sprogo, and a bridge for both road and rail traffic between Sprogo and Funen. A severe storm made it difficult for emergency services to reach the train. An emergency centre was established in the town of Nyborg at the western end of the bridge. Fatal accidents are rare on the country's highly developed rail network. The 18km-long bridge across the Great Belt carries around 21,000 train passengers every day and more than 27,000 vehicles cross the bridge each day.